On 18th January, Oguri Shun attended a promotional event for the movie 'Kitsutsuki to Ame' in a kimono. The only one striding confidently onto the stage dressed in traditional wear, he remarked,"It's a new year, so I thought I'd try a change of mood too. I want to be the type of guy that people will say 'That fella is always doing stage greets in a kimono'. But since just now, everyone has been calling me Young Master. Looks like I got a little carried away all by myself. I feel a little embarrassed." The audience got to ask the cast for advice in the 'Life Matters Discussion Corner'. A girl asked,"How do I find a love that when I think of him, tears would start to flow?" Oguri stalled and was thinking of an answer when cast member Yakusho Kouji chipped in,"You should just find an awful guy then." 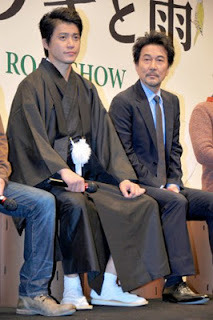 The audience laughed as Oguri agreed,"How do you find one? I guess that's right. Go find that awful guy." 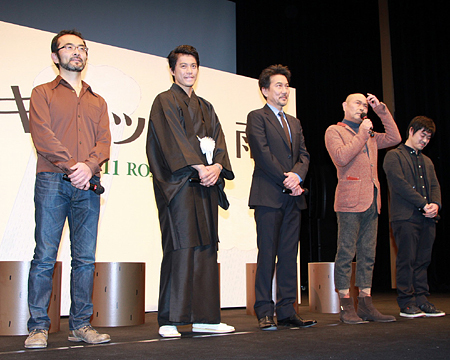 Other cast members in attendance were Furutachi Kanji, Ibu Masatou and director Okita Shuichi. 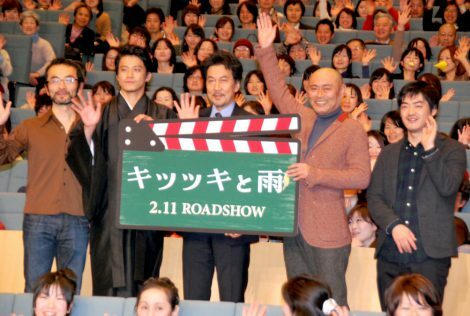 Kitsutsuki to Ame opens nationwide on 11th February.